"This is an easy grill recipe that requires very little preparation time outside of the marinating but delivers great taste! This can be served with any grilled side dish that suits your style!" Whisk the water, sugar, and salt together in a bowl; pour into a gallon-sized resealable plastic bag. Add the rosemary, thyme, and pork chops to the bag. Coat the pork with the marinade, squeeze out excess air, and seal the bag. Marinate in the refrigerator at least 4 hours. 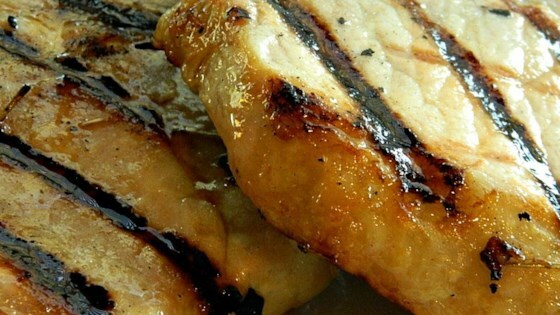 Remove the pork chops from the bag, and discard the marinade. Cook on the preheated grill until no longer pink in the center, about 10 minutes per side. An instant-read thermometer inserted into the center should read 145 degrees F (63 degrees C). Easy recipe tastey.Used Montreal Steak salt mix instead of Kosher garlic and anise in mix.Fragrant flavor with rosemary and thyme.Fresh ingreds a must. YUM! I am not much on pork chops but my family loves them. These were very flavorful and moist. Buck uses a little Soy but no water to the marinade. I love brining and did not have one for chops! Thanks for sharing Marianne, it really made the chops tender. I am going to try this with other cuts soon.